The Fiery Furnace is a Sunday school lesson that is very popular, so you may already know it but it's one of our favorite bible stories for kids. After you read or listen to the story scroll down and download a free bible lesson to go along with it! At one time there was wicked king named Nebuchadnezzar who ruled a mighty land. He was very selfish and proud and wanted everyone to worship him so he had a huge image made that was covered with gold. This image was set up, as an idol to be worshipped, on the plain of Dura, near the city of Babylon. When it was finished, it stood almost a hundred feet high; so that upon the plain it could be seen far away. Then the king sent out a command for all the princes, and rulers, and nobles in the land, to come to a great gathering, when the image was to be set apart for worship. The great men of the kingdom came from far and near and stood around the image. Among them, by command of the king, were three young Jews, Shadrach, Meshach, and Abednego. When the ceremony began all the trumpets sounded, the drums were beaten, and music was made upon musical instruments of all kinds, as a signal for all the people to kneel down and worship the great golden image. But while the people were kneeling, there were three men who stood up, and would not bow down, Shadrach, Meshach, and Abednego. They only knelt down before the one true God. "O king, may you live for ever! You gave orders that when the music sounded, every one should bow down and worship the golden image; and that if any man did not worship, he should be thrown into a fiery furnace. There are some Jews, whom you have made rulers in the land, who have not done as you commanded. Their names are Shadrach, Meshach and Abednego. They do not serve your gods, nor worship the golden image that you have set up." "Shadrach, Meshach, and Abednego, was it on purpose that you did not fall down and worship the image of gold? I will give you another chance, the music shall sound once more, and if you will worship the image, it will be well. But if you will not, then you shall be thrown into the fiery furnace, to die." "King Nebuchadnezzar, we are ready to answer you at once. The God whom we serve is able to save us from the fiery furnace, and we know that he will save us. But if it is God's will that we should die, you should know, O king, that we will not serve your gods, nor worship the golden image." "Make the fiery furnace hotter than it has ever been before, as hot as fire can be made; and throw these three men into it." Then the soldiers of the king's army seized the three young Jews, as they stood in their loose robes, with their turbans on their heads. They tied them with ropes, and dragged them to the mouth of the furnace, and threw them into the fire. When the door was opened the flames rushed forth with such fury that they killed the soldiers who were holding Shadrach, Meshach, and Abednego and they fell down bound into the middle of the fiery furnace. "Did we not throw three men bound into the fire? How is it then that I see four men loose walking in the furnace without harm; and the fourth man looks as though he were a son of the gods?" And the nobles who stood by watching could barely speak, so great was their surprise. "It is true, O king," at last they said to Nebuchadnezzar, "that we cast three men into the fiery furnace, expecting them to be burned up; and we cannot understand how they have not been destroyed." They came out of the fiery furnace and stood before the king, in the sight of all the princes, and nobles, and rulers; and every one could see that they were alive. Their garments had not been scorched, their hairs had not been singed, nor was there even the smell of fire upon them. "Blessed be the God of Shadrach, Meshach, and Abednego, who has sent his angel, and has saved the lives of these men who trusted in him. I make a law that no man in all my kingdoms shall say a word against their God, for there is no other god who can save in this way. And if any man speaks a word against their God, the Most High God, that man shall be cut to pieces, and his house shall be torn down." If you liked this bible lesson, you'll love the Veggie Tales version, it's one of our favorites! Wow! Now that was an adventure! Can you imagine serving such a terrible king that he would throw you into a fire just because you didn't bow down to his statue?! I bet Shadrach, Meshach and Abednego were very scared, don't you? I mean surely they didn't want to be burned up in a fire! They knew that God had the ability to save them and they trusted that even if God chose not to save them that they still would not bow down to King Nebuchadnezzar's silly statue. Do you have that kind of faith and resolve? Honestly, we don't know if we do, but we sure try to and pray that God will give us strength to do what's right even when it's the hardest thing ever! Has there ever been a time when you were scared to do the right thing but did it anyway? Or maybe you did something wrong but were too afraid to make it right? That's pretty normal, it takes courage to do what's right when you're scared, but boy do you feel better when you do the right thing! Our mom once told a lie to a lady at church. She felt so bad about it that she knew she needed to call the lady and tell her the truth but she was very scared. She was so scared that she felt sick! Later in the day she finally got the nerve up to call the lady. She told her the truth, apologized for lying and asked the lady to forgive her. It was very hard but she felt so much better after she did it. The lady forgave her and she was thankful our mom called to tell her the truth. Do you need to tell someone the truth about a lie you've told? Do you need to ask someone to forgive you? Go ahead and do it, you may be scared but you'll probably feel better once it's done and people may feel like they can trust you again because you told the truth. Did you know that Shadrach, Meshach and Abednego were not these guy's real names? 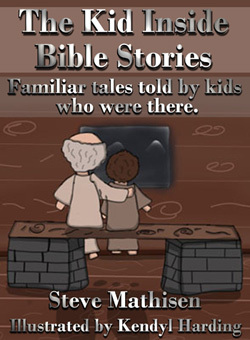 If you enjoyed the story of The Fiery Furnace there are lots more read aloud bible stories found in the bible. Like Shadrach, Meshach, and Abednego's friend Daniel who was thrown into a lion's den! Or read about another evil king and a brave man named William Tell who stood up to him.